It’s finally HERE!! The brand new series from your friends at Country’s Family Reunion: Country’s Family Reunion Gettin’ Together! 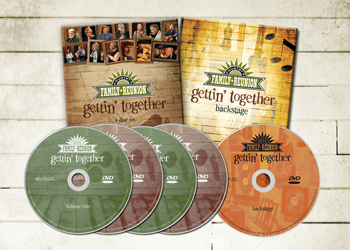 This wonderful 5 DVD set includes some brand new folk hanging with our CFR family (Dailey and Vincent, Don Edwards, Joey and Rory, and others), plus some of your favorites (Roy Clark, Johnny Lee, Neal McCoy, Bill Anderson, Jeannie Seely, Jean Shepard, and many more!). Some of the songs include “Someday Soon,” “My Only Love,” “The Bible and the Belt,” “I’ve Done Enough Dyin’ Today,” “Ghost Riders in the Sky,” “Stuff that Works,” and more! You don’t want to miss one of our most lively series ever! Just 29.95 plus 6.95 shipping and handling.